This is a super simple casserole to make. The whole family loves it, so it’s a great way to get them to eat lots of veggies. There is no written recipe. 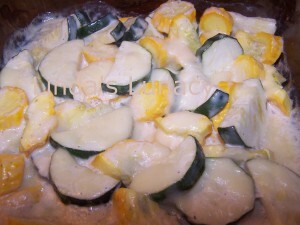 The amounts depend on how big your yellow squash and zucchini are and how much you want to make. You can use only one kind of squash if that is what you have on hand. You can also use homemade ranch salad dressing instead of store bought. Slice the squash, place into bowl. Coat with bottled Ranch Salad Dressing. If you like saucier casseroles, use more. My kids like extra sauce. I usually use enough squash to fill a 9×13 baking dish, and would use a whole bottle of Ranch. Pour into lightly greased baking dish. Top with your favorite grated cheese. We use Mozzarella. For browner cheese, put on casserole before you put it in the oven. Otherwise, you can wait to put the cheese on the last 10 minutes of cooking. You can also sprinkle with bread crumbs before baking for a crispy crust on top. Bake in a *350 oven for 30-45 minutes until tender, cooking time depends on the size of your pan and the thickness of your slices.